Summer is here! The kids are finished with school for the year and parents are scrambling to find ways to keep their children occupied. With hours of free time each day, it can be easy for kids to get wrapped up with screen technologies, from smartphones and tablets to video games and TV. While having some time to relax and decompress from the school year is important, parents need to ensure the summer isn’t spent sleeping in, texting online, binge watching TV and conquering video games. If you let them, they’ll do it. According to a survey conducted by Influence Central Consulting , 44 percent of kids say they prefer technology to playing outside. That should be a cause for concern! Spending too much time on the couch can make children lethargic, socially disconnected, and unhealthy. Lack of exercise can lead to weight gain and isolation is just depressing. Stick to a schedule: One of the first things that go when the kids finish school is their daily routine. While it’s okay to give the kids a bit of a break to recharge their battery at the end of the school year, establishing a summer schedule will help ensure they are not wasting their days on the sofa . What your child’s schedule will look like depends on what you have planned, their age, and many other factors. The key to is keep them occupied. Create a summer bucket list: Make a real effort to explore with your kids the types of things they might want to do and that you can afford. You may be surprised to learn about the scope of their interests. Get the kids to create a list and then start planning activities throughout the summer. Assign responsibilities: Assigning chores is a great way to keep your kids busy. They don’t have to be difficult, just tasks that will help them become more responsible. Put them in charge of taking care of family pets, checking the mail, watering plants, and helping with household cleaning. Maintain screen time limits: Many families have daily screen time limits and rules for TV/computer use during the school year. Don’t throw these rules out the window just because it’s summer. Stick with your current time limits or offer screen time as an incentive for doing chores or helping around the house during the day. Keep the focus on outdoor activities: Getting the kids out of the house is one of the best ways to get them off the couch. Planning outdoor play time in the backyard, with other kids in the neighborhood, or at your local park are simple ways to get the kids outside. Oh, and don’t forget family bike rides! You can also get the kids involved in gardening, helping with yard work, and playing yard games such as Frisbee and bocce. Send the kids to summer camp: Summer camp is a great way to get your kids out of the house, meet new people, and keep learning throughout the summer. Today, there are countless summer camp options for a range of budgets, and it’s easier than ever to find one that your kids will find interesting. From sports to music, art, science, and more, there are lots of options to consider. Plan a summer getaway together: A family vacation is a great way to decompress and relax. Even before you take your trip, get the kids involved in the planning process, ask them about what they would like to do, and where they want to visit. You can also plan family outdoor days and take trips to a local hiking trail, the beach, plan a picnic, and other outdoor destinations. Create play groups: Setting up play groups with your child’s classmates, friends, and family members is a great way to get them active physically and socially. Parents can share hosting responsibilities to give each other a break. 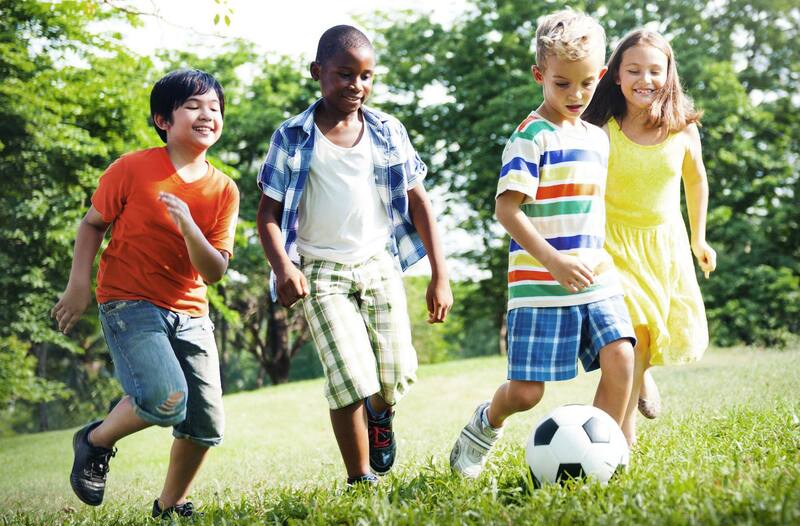 Sign them up for a fitness membership or sports team: Depending on your child’s age, signing them up for a summer fitness activity or sports team will keep them busy. It’s a great way to inspire kids to become stronger and fitter while having fun at the same time. There are lots of ways to get the kids off the couch this summer. All it takes is some planning and tapping into your child’s interests, and you’ll have them leaping off the couch to get outside and be active.